Rehan's Uniforms - Connect Siouxland Clothing & Access. 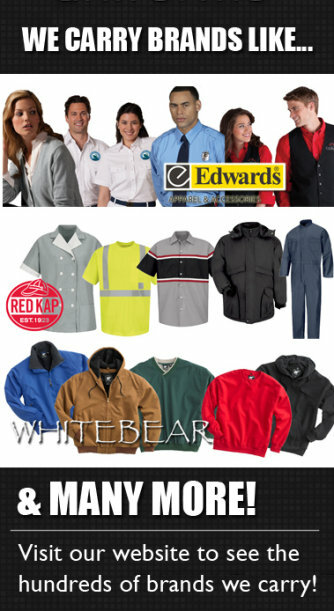 We are a factory authorized distributor for Red Kap Industries, Dickies Workwear, Edwards Garment Co., Bulwark Protective Apparel, White Bear Clothing Co., Uncommon Threads, Cherokee Medical, and Horace Small Uniforms. Red Kap Industries is America's largest occupational apparel maker, and a division of VF Corporation, the world's largest publicly-held apparel manufacturer. We also carry a full line of career wear and casual wear, security apparel, outerwear, as well as aprons and chef wear. We have attempted to put together a line of uniforms for the embroidery and screen printing industry. These uniform items will be offered at a wholesale price to authorized resellers. Prices will not be posted to protect our distributors. A price list will be e-mailed to all legitimate businesses who request one, providing all information is completed and returned to us. For more local items visit us on facebook.